Just 50 miles northwest of New York City, this log cabin situated on Pinecliff Lake, on the NJ/NY state border, was built in 1940 and fully restored in 2008. Two bedrooms on the main floor sleeps 1-4 exceptionally comfortably. Outdoor deck with round table and benches as well as additional Adirondack seating; cantilvered deck over the lake; great place to sit and read, or simply soak up the sun. Deck also features a terra cotta chimnea (fire pitt), which is great for cool nights, sipping a glass of wine (or cocktail of choice!) and watching the sunlight slowly dip behind the mountain. If you're looking for a place to unwind from the hustle and bustle, quiet nights (and days), this is the place. After living and working in New York City for the past 20+ years, I decided I wanted a place to escape to on the weekends; a laid back place with little-to-no-stress. A friend called me one day in May 2007, from the cell phone saying he just drove by this great log cabin, for sale; has 'your name all over it.' So I asked him to send me a pic from his iPhone and the next I know, I'm in contract to buy the cabin. Funny how these things happen. If you're looking for a peaceful, serene, cozy, get-away-from-the-hustle-and-bustle-of-New-York-City-kind-of-place, in less than 90 minutes of travel time ... this is the place for you. Once here and settled, you will forget you are only 50 miles away from New York City. Beautiful Adirondack-appointed log cabin, fully renovated with all the amenities of today (WIFI, flat-screen TV, stereo surround sound). 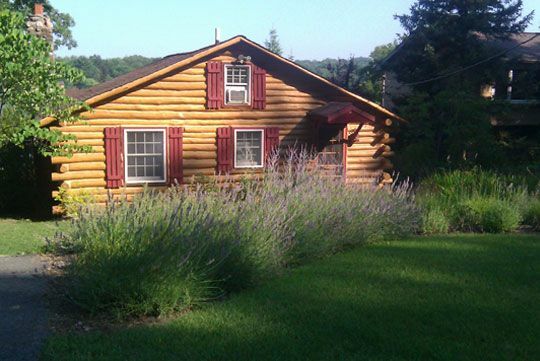 Cozy, Lake-front log cabin situated on Pinecliff Lake. Great place to sit with morning coffee, or basque all day in the sun; end the day with an evening cocktail/wine before dinner. At foot of lake (5 minute by car) is the ShopRite Shopping Plaza which includes: ShopRite, Frank's Pizza, McDonalds, Liquor/Wine Store, dry cleaner, Rite Aid Drug Store, diner. There is also a Walgreens on other side of plaza. Just few minutes into town, there is an A&P as well (10 minutes by car). Another relaxing stay in this wonderful cabin. Have stayed here more than a few times before and really love the cabin and the peaceful setting. Dennis is such a great host and keeps the cabin in tip top shape. Already looking forward to the next stay! We had an absolutely wonderful time staying at Dennis's cabin. It's a beautiful house with a lush backyard perfect for taking in the scenery. Dennis was a wonderful host and was super well prepared for our stay (and was kind enough to leave the A/C on for our arrival during a really hot week!). He was always available for any questions we had. I would definitely stay here again! I had a great stay at the cabin. The property is as advertised - it's well maintained and cozy, with beautiful lakefront views and easy access to the water. The cabin was well stocked with cooking essentials. Dennis checked in throughout the stay to make sure we had everything we needed. I hope to visit again. Fantastic, intimate cabin on a small, beautiful lake. Well equipped kitchen. Had a wonderful time using kayaks and chiminea!!! The area boasts more than 70 lakes and lots of hiking trails, including the Appalachian Trail. Nearby activities include: Wawayanda State Park, Sterling Forest, Harriman State Park, Bear Mountain State Park, High Point State Park, Deleware Water Gap Recreational Area, Wallkill River National Wildlife Refuge, New Paltz (NY), Woodbury Common shopping outlet (40 minutes away), West Point Navy Academy and Cornall-On-Hudson (to name only a few). Please note: additional guests are not permitted at the cabin without prior written consent from owner. Failure to comply with this policy will result in immediate termination of Rental Agreement; with no refund.